The conventional PC has a lot of areas of application in the electronics workshop. But when it comes to real-time, real-world, monitoring and control, the typical computer, PC or laptop, can present some serious problems. There are several options on offer, RS232, USB, Printer port, and the soundcard with its MIDI channel. All of these share the same problem - their common sides are tied to mains earth via the computer. 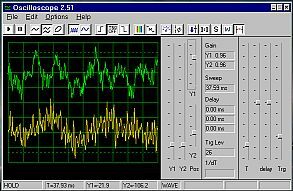 This means that a mains hum earth loop will be a feature of all audio measurements. Another major limitation is that most soft audio instruments are designed to use the soundcard, but in terms of noise and bandwidth most soundcards are generally pretty ordinary - about the level of a mid-Fi ghetto-blaster. Many are rolling off down where things are just getting interesting with loudspeaker enclosures, for example. Sine, square, and triangle from 10Hz to 22kHz. Signals can be saved as .PCM files. I find this effective for fine tuning, but not for initial stringing up. 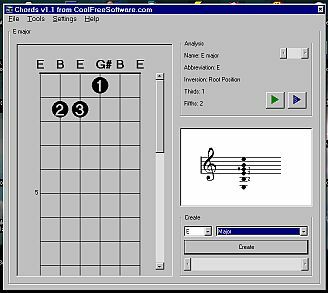 As well as a chord reference and creator, you can save and recall, and save chords as .WAV sound files and .BMP bit images. One of the other features is a built-in tuner that produces notes. Maybe I'm just getting old and stupid, but when I'm re-stringing a guitar (particularly when I have had to take all the strings off to get at the electronics), I find initially retuning to a pitch easier than trying to find where I am on a tuning meter. In my accoustic guitar case I carry a tuning fork, and tune up by striking it and holding it between my teeth. And it has never had a flat battery that I can remember. 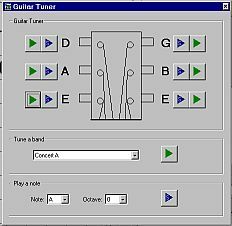 However where it really counts, such as recording tracks, then the tuning meter is generally more accurate for getting tune really spot-on (or exposing the guitar as badly in need of a setup). The CRO has always been my favorite test instrument. The basic CRO draws a graph on a screen of how a voltage varies over time, optionally how one voltage varies (Y) against another voltage (X). But when it comes to electronics, and audio in particular, having even the most humble CRO at your disposal is better than no CRO at all. As you move up-market CRO's grow useful features such as a second Y-beam, and fancy triggered timebases that allow superior stability of the drawn waveform and dual timebases that allow the detailed examination of parts of the waveform. 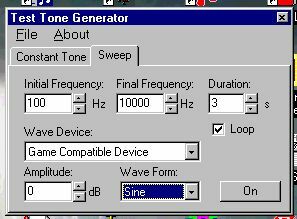 The problem with any purely software CRO is that it must use the PC sound card as an interface, and soundcards have a couple of significant problems; they are an AC coupled channel only, and often of fairly indifferent quality, which is a serious drawback in a test instrument. Whatever other facilities may be offered, the inability to display signals down to DC is a serious drawback and places all soft CRO's that don't have a specific outboard pod, such as the commercial PicoScope and BitScope, in the minimalist class. The other problem for audio work is that the input common is, perforce, tied to mains ground. This not only limits all measurements to ground referenced, but it also opens the door to hum loops and induced instability in the equipment under test, and is therefore more likely to confuse and move you backwards, rather than illuminate and move you forwards. My main problem with the soft CRO's I've tried is that they suffer from so many artifacts it's hard to figure out what is being caused by the amplifier under test, and the test instrument itself. In effect you have to know what you are looking for first, so they aren't good at exposing the unexpected. Again, not a good quality in a test instrument. If you seriously intend to make “informal” hardware connections to your PC I strongly suggest that some form of front-end is used ahead of the soundcard input. I've actually seen a few of the older and better quality ghetto-blasters that have a range of inputs, line outputs, and even level meters that would make excellent front-end firewalls for general audio bench work. Or you could build a buffer isolator with level indication and setting. My own bench instrument setup is still analogue, but it is very applicable to using PC-based instruments (maybe even into a disk bay for easy front access?). This consists of a front end which is an Electronics Australia Noise and Distortion meter. Apart from the nulling networks and spot frequency oscillator this is basically an audio millivoltmeter with a calibrated input attenuator and a buffered normalised output. The buffered output is distributed to the CRO, frequency counter, and computer interface when used. Using a test signal the CRO is initially set so that it's screen divisions match the voltage shown on the millivoltmeter. The main control then becomes the millivoltmeter attenuator with only occasional attention to the CRO timebase. When you get a reasonable reading on the MVM then the CRO and counter will also be receiving resonable signals. by Marcel Veldhuijzen - BIP FreeWare Fun - Wellerlooi, The Netherlands. Release date: April 20, 1997. 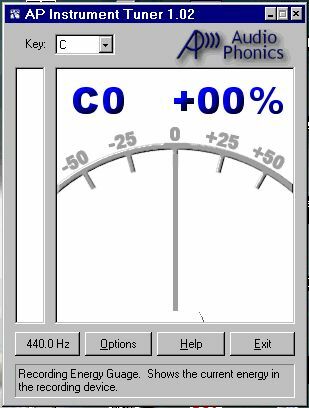 While the sampling rate and sampling duration controls leave me a bit confused as an ol' time CRO user, at least this one is intended to be calibrated so the screen scale actually means something. There is an editable .CFG file that allows the starting conditions to be stored and set, including the calibration constant. When I tried to use the Edit/Copy function and paste the screenshot into IrfanView it barfed on something that Scope3 had written in the copy. Won't run with “no splIB.DLL error in waterfall procedure”. However it seem to require that you also download some Delphi procedure libraries. So this isn't actually a CRO, more like a video of one. While this is an interesting programming exercise I honestly can't think what earthly use it would be to either an engineering student or a technician. It might have some function teaching what each of the CRO controls do, if it actually looked like a CRO front panel. But it doesn't. It's a bit like a Flight Simulator where the aircraft looks like a brick, and it doesn't teach you to fly either. I found this very easy to install and use, having no trouble looking at Santana's “Lion's Head” CD. This shot shows the Left and Right stereo channels during the organ solo in Evil Ways. 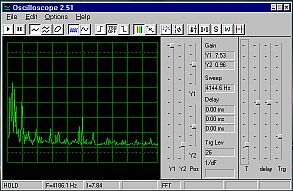 Oscilloscope for Windows uses the sound card as an analog-to-digital converter, providing complete oscilloscope and spectrum analyzer functionality in Windows95 environment. 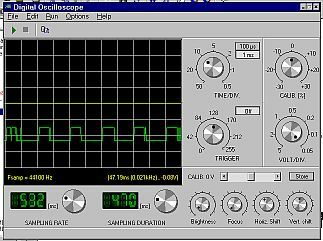 (*) 16-bit sound cards are currently used in 8-bit mode; 16-bit mode will be supported in further releases of Oscilloscope. ... this one is hard to beat. Aside: it's quite an education to look at your various recordings in X-Y mode where the Left and Right Channels are plotted against each other to view the stereo spread, if any. A quite full help file is supplied which is not at all coy about the limitations of soundcard-based CRO's. 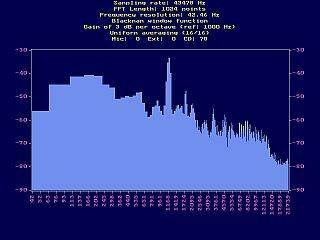 A fast real time spectrum analyser for DOS, Linux, Linux/X, and Sun which displays the normal soundcard inputs, or CD drive. Full-screen DOS like display, but shows no signs of latency. Like most DOS programmes this has a set of keys that are alive and change settings. There is enough on-screen for you to find the minimal but effective help and work it all out. While it has sundry filter and sampling options you will have to do your own research into their significance. With a microphone plugged in to the sound card it is PDQ - Pretty Damn Quick, with no obvious latency. A slightly curious programme that comes up as three different windows. 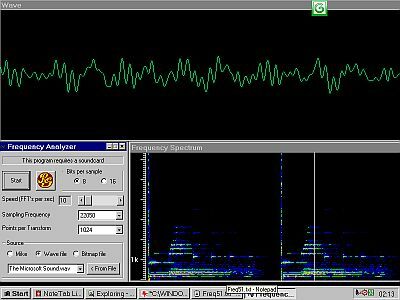 Much more colourful than Freq51, but also much less functional, this programme actually provides both a continuous CRO view of the waveform and a repeating spectrogramme (in this case The Microsoft Sound.wav). While this is interesting it is not of much practical use as both displays are uncalibrated, and the control panel only allows source, sample rate, and FFT length selections.